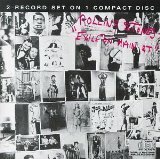 Exile On Main Street is ragged and frayed and gloomy – pure Stones from the 70s. It’s a masterful blend of rock ‘n’ roll, blues, country and soul, fueled by booze and drugs and life in the fast lane. Downloads for mp3 players and CD purchases are on Amazon, and iPod downloads are on iTunes. Two Stones' playlists are in the Playlist Vault.